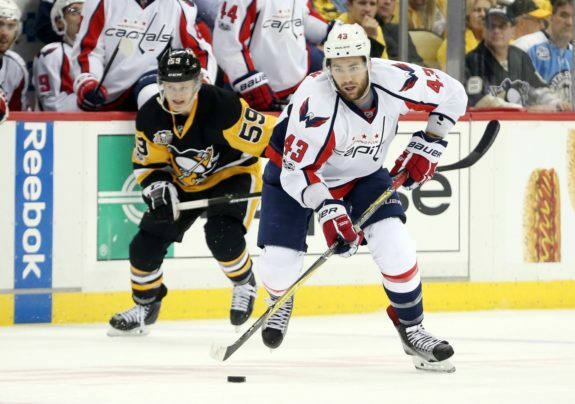 BALLSTON – Upon his return to Kettler Capitals Iceplex for his fifth NHL season, Washington Capitals forward Tom Wilson affirmed that one of the best parts of the start of training camp is reuniting with his team. Over the offseason, he took time to not only work on improving his overall game but also took the time to refresh and relax before getting back in the rhythm of the regular season. Over the last few seasons, the 6-foot-4, 217-pound forward has made himself a physical force with the team. One of his biggest responsibilities for him has been acting as the team’s tough guy on the forward lines, as well as throwing his weight around and dropping the glove when the scenario arises. However, heading into this year, he has more opportunity, and perhaps more responsibility. With key departures on the forward lines, there are openings on the Capitals’ top-six and a lot more ice time up for grabs. And though many of the prospects are vying for these open spots, Wilson is already a proven player on the main roster who can make that jump to the second line. Still, even when he is up for a promotion, he keeps his cool, collected demeanor. He said that though everyone has individual goals, he is more focused on what he can do to help his team as a whole. In 82 games this past season, Wilson recorded a career-high seven goals and 19 points, and most notably, 133 PIM. He did mention that it is a goal of his to stay out of the box and that he has had that conversation with Barry Trotz on multiple occassions. “I want to help my team on the ice, and I can’t do that sitting in the box,” Wilson said of his penalties. Despite lower point totals and a lot of time in the sin bin, he ended the year on a strong note with an oustanding postseason. Not only did he register three goals through 13 playoff games, but he made himself a force on offense and showed off his skill-set. If he can carry that strong finish to the year over into this campaign, he will have a good shot of moving up the lineup. But when it comes to line combinations and where he will be placed heading into the 2017-18 campaign, the former 16th overall pick said he doesn’t “look too much” into any decisions. 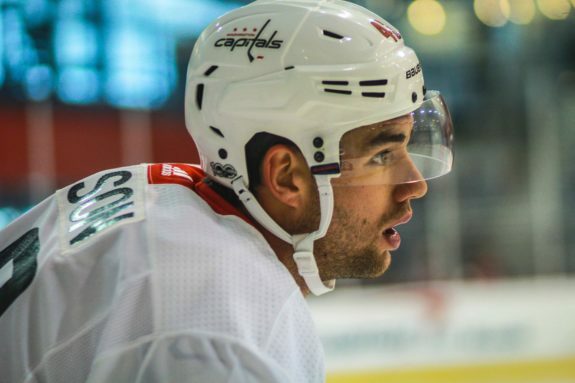 Over the last few seasons, there hasn’t been much change to the Capitals roster, but with a lot of losses over the course of the summer, the team is hosting a pool of prospects and signees to come in and compete for vacancies on the main roster. While there are a lot of new faces – so many, in fact, that they fill two locker rooms – Wilson is excited to see more variation this camp. 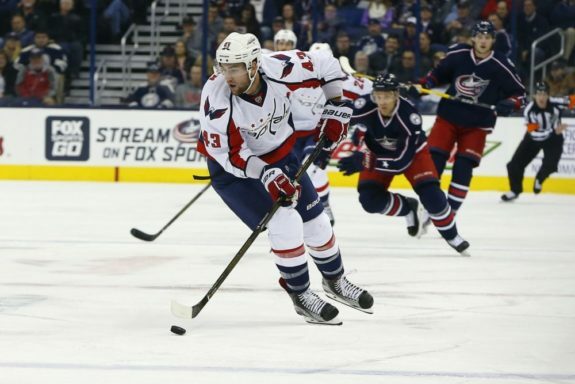 With the Capitals bringing a lot of youth on board to fill the holes on the main roster, there are some questions regarding if this team remains a Stanley Cup contender. They lost a lot of depth and some veteran presence, and with some players coming in with little to no NHL experience, many are unsure if the prospects are enough to power the defending President’s Trophy winners up the standings and to an impressive playoff run. Despite a lot of players leaving the team, Wilson is confident that the team will remain a dominant force, and anticipates another strong season and return to the playoffs. He also mentioned that though Washington may not be the top-dog this season, the “running-gun, top-of-the-league” teams aren’t always the ones that hoist the Cup at the end of the season. Though he is still one of the younger players on the team, the 23-year-old forward has been through the grind and knows what it’s like to be a prospect just entering the NHL. So for him, he felt that he could offer some words of wisdom for the young players coming in and looking to make an impact.